Hello again! Three awesome covers to share with you guys today. This first cover was posted from Ottawa, Canada. Many thanks to Maryam Muhammad Irwan! On 21 April 2011, in honor of the U.N.'s International Year of Forests, Canada Post released a two-stamp issue (2 se-tenant stamps on the right) that speaks to both the diversity and intrinsic value of Canada's forest. The stamps offer two views of the contemporary forest; one showing the marvel of life found in the forest floor and the other depicting the sheer strength and lush fecundity of a new growth North American rainforest through a close-up of new trees that culminates in a fresh canopy of green leaves. 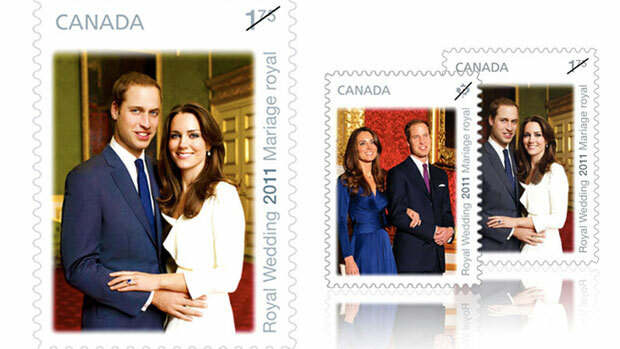 The left stamp was released on 29 April 2011 to mark the Royal Wedding of Prince William and Kate Middleton. Next, we have a lovely cover posted from Everett, Washington, U.S.A.. Many thanks to Bryon Peterson! The stamps were issued on 28 September 2011 to honor Romare Bearden (1911-1988), one of the 20th Century's most distinguished American artists. Four collages by Bearden are featured in the stamp art: Conjunction (1971); Odysseus: Poseidon, The Sea God - Enemy of the Odysseus (1977); Prevalence of Ritual: Conjur Woman (1964); and Falling Star (1979). Last but not least, is a beautiful cover posted from Vaduz, Liechtenstein. Many thanks to Vural Oguz! To commemorate the coming Year of the Dragon (23 Jan 2012 - 9 February 2013), Liechtenstein Post released the first silhouette postage stamp - in the image of a dragon! Designed by Stefan Erne, the self-adhesive stamps were cut out using state-of-the art laser technology. 2 Awesome Covers From America! My First Cover From Chile!! !